It’s time to face the awful truth: Those cheap clothes we can’t get enough are probably the handiwork of impoverished children from Bangladesh, some as young as 6. About a third of the children who live in the slums of the capital of Dhaka spend an average of 64 hours a week making clothing for the world’s leading brands and retailers, according to the Overseas Development Institute. The London-based think tank, which conducted a survey of 2,700 households, found that 32 percent of 10- to 14-year-olds were skipping school so they could work full time at garment factories. Most of them earned less than $2 a day. “Our survey raises serious concerns over the issue of child labor in the supply of garments from factories in Bangladesh to consumers in Europe, the U.S., and elsewhere,” ODI said. Funded through a grant from the Bangladesh office of the United Kingdom’s Department for International Development, the study is among the largest to scope out child work and education in the South Asian nation, the organization said. Significant numbers of both boys and girls reported extreme fatigue, back pain and fever, and superficial injuries. Despite some efforts by Bangladesh to eliminate the worst kinds of child labor in recent years, more than 5 million of the country’s children, aged between 5 and 17, remain engaged in some form of employment, according to the International Labour Organization. While the minimum working age in Bangladesh is 14, children aged 12 and above are allowed to carry out “light work,” for up to 42 hours a week, but only as long as it doesn’t get in the way of their education. “Light work” explicitly bars children from pulling all-night shifts or performing any tasks that is deemed hazardous. ODI says that these labor laws are poorly enforced and broadly ignored. By age 14, it said, more than half of children living in Dhaka’s slums were already working. Two-thirds of the girls who are employed end up toiling for the Bangladesh’s $19 billion-a-year garment industry—the world’s second-largest after China—compared with 13 percent of the boys. But there is a “systemic problem of enforcement and compliance,” ODI noted. Most inspection programs established by Western brands cover only large, formal-sector enterprises, or about one-quarter of Bangladesh’s garment factories. Plus, even the so-called “first tier” is heavily involved in sub-contracting work to unregistered facilities with even laxer oversight, often without the knowledge of the commissioning brands. ODI urges brands to take a more proactive role and provide construction solutions to the problem of child labor. Originally published on December 9, 2016. I have a concern of using child labor. The child is not being or being able to enjoy being a child or able to get their education. The thoughts are to help their families. Working allows them to get food and other amenities that is needed at home. With the huge disaster of the Joe Fresh garment factory collapsing in 2013, loosing 300 or better employees, basically children, would spike interest in making the work environment a bit better. Not to just throw away lives like they are livestock and to keep moving. Where is the morality here? Where are the guidelines for this country to stop enslaving these children? I don't agree with the use of children as slaves. I believe the government needs to step up and do what it has to do to bring up the economy. It's time to face the awful truth: Those cheap clothes we can't get enough are probably the handiwork of impoverished children from Bangladesh, some as young as 6. About a third of the children who live in the slums of the capital of Dhaka spend an average of 64 hours a week making clothing for the world's leading brands and retailers, according to the Overseas Development Institute. The London-based think tank, which conducted a survey of 2,700 households, found that 32 percent of 10- to 14-year-olds were skipping school so they could work full time at garment factories. Most of them earned less than $2 a day. 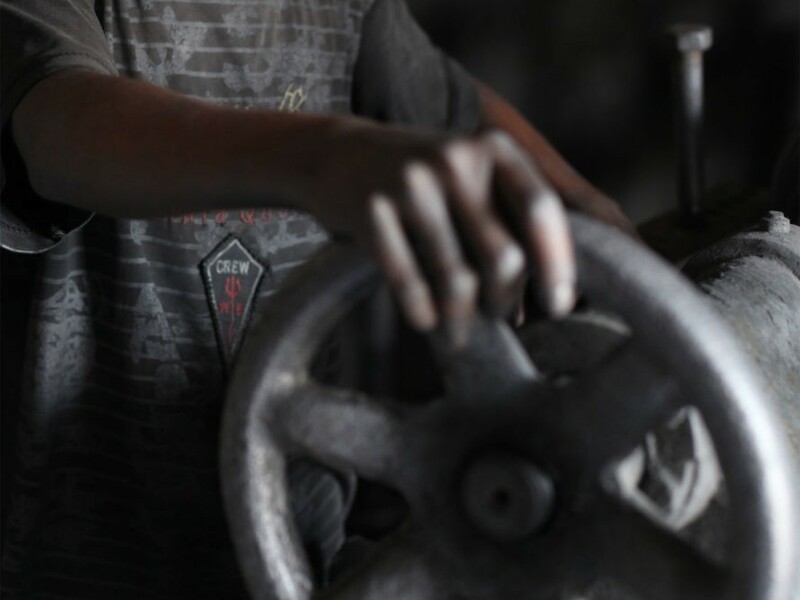 "Our survey raises serious concerns over the issue of child labor in the supply of garments from factories in Bangladesh to consumers in Europe, the U.S., and elsewhere," ODI said.